For the first picture, if you are referring to the red growth in the middle of the picture it kind of looks like a tiny nemastoma macro. Thanks for the id this the best guess I've seen. Here is an updated picture of the algae. 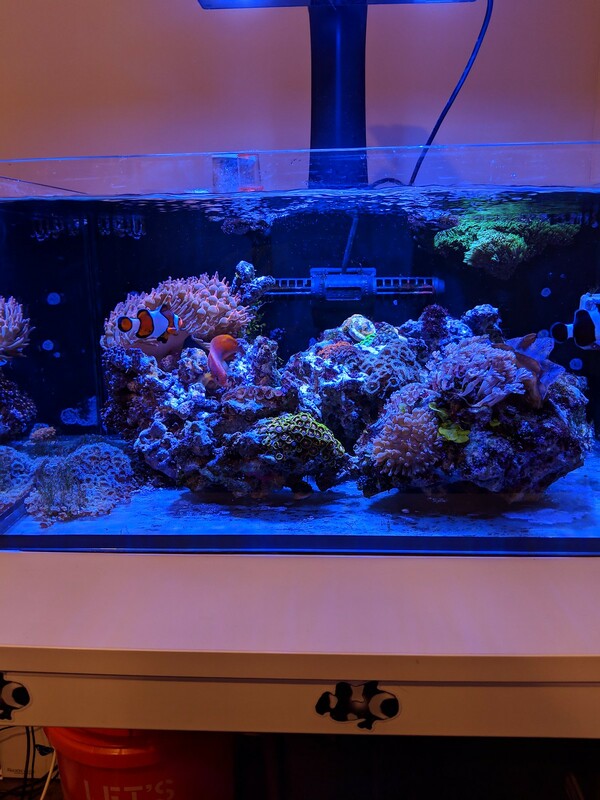 Hey everybody - getting back into the hobby after a few years away with an IM Nuvo Fusion 25 gallon. This will be my third reef tank but my first time with a nano. The dimension of this tank are pretty cool: 24"x ~17" x 11.5" really liking how it looks so far. The plan is to keep things simple on this NYC apartment tank and reuse some stuff I have around from my old 60g cube. Going without sand or a skimmer for now. I want to stock clowns and BTAs probably with some softies like gsp or xenia. Just got the RODI yesterday and am picking up some LR from a local reefer on Sat. Will bump this thread with some pics and updates as I go - haven't seen too many Nuvo 25 builds out there. I really like the look of the NUVO 25 and can't wait to see how your's turns out. Mind if I ask why you aren't putting any sand in? Looking at getting a tank started at work and have been following different threads on how people are doing nano tanks. Definitely get a Nuvo 25 if the size is right for you. Very happy with the tank and it feels almost as large as my past 40 breeder / 60 cube setups. 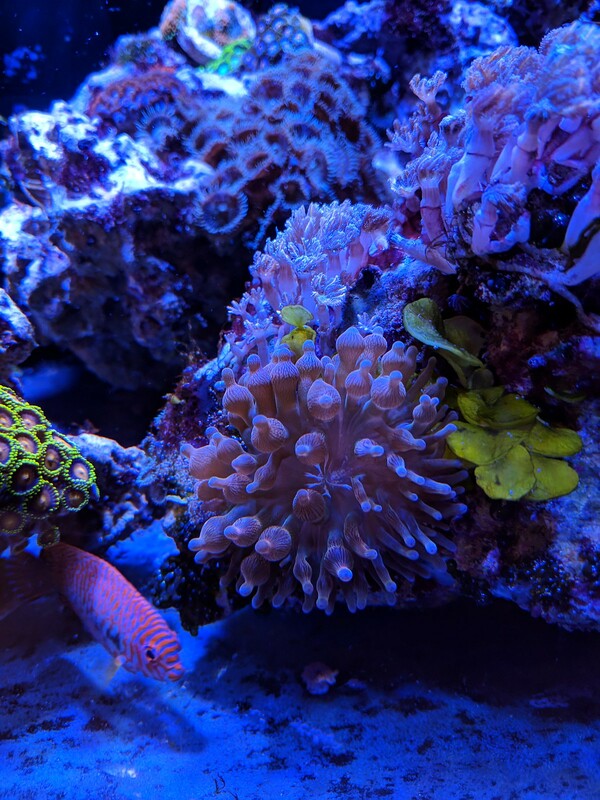 I went Barebottom mostly just to experiment with it in my 3rd reef and also because I know I will have to move this tank a few times during its lifespan & its easier to keep clean. Is the this soft or rigid? I still think nemastoma. If rigid, there is a type of branching, rigid coralline out there. Nurture that and propagate it, that could easily pay for your salt yearly, very nice specimen that is not seen too often. It is non calcerous, beautiful nutrient export! 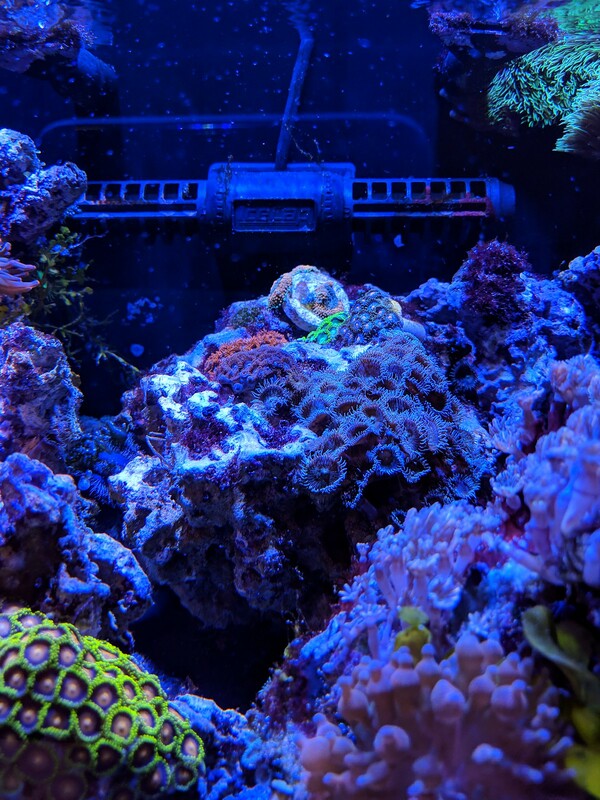 As for that green, that may be a calcium sucker, which can compete with corals for Ca uptake. The methodologies for reef keeping are vast in numbers, in turn a lack of exploration is a disservice to one's self. I believe the algae is Galaxaura Sp - Pom Pom Algae. I removed a fist sized chuck a few weeks back but left some to regrow. Looks great so far. How's the potter angel? So far so good he grazes constantly and is such a nice fish. Always wanted a potter's and hes a good centerpiece for this little tank. I'm debating now if I have room for a blenny or if I am better off with just him and the clowns. How do you like the Icecap K1 protein skimmer? I'm planning a lagoon but am hoping for quite a few fish and am wondering whether the skimmer can help with the heavy load. I'm thinking small angel and 1-2 clowns like you, and adding a small flasher wrasse and a goby. The aquamaxx hob 1.5 seems like a beast and everyone seems happy with it, but it sticks out much more from the tank. I'm planning one very similar to yours (IM 25), but will likely go no skimmer. Where does the Purigen sit? Is it in a filter bag? I saw a mention of a media insert, but I need to look into that a bit more. middle shelf, and yes it coming in a bag, can also be purchased in bulk. Hey bro. Following along. I'm looking at an IM 50EXT. How do you like the IM build quality? Put some more pics up when you get a chance. 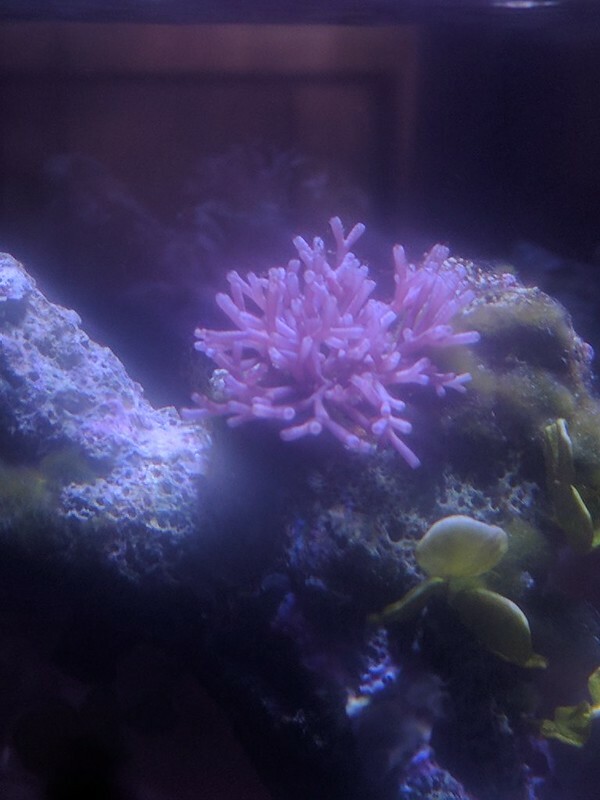 I've been gone for awhile... is that a coral beauty? 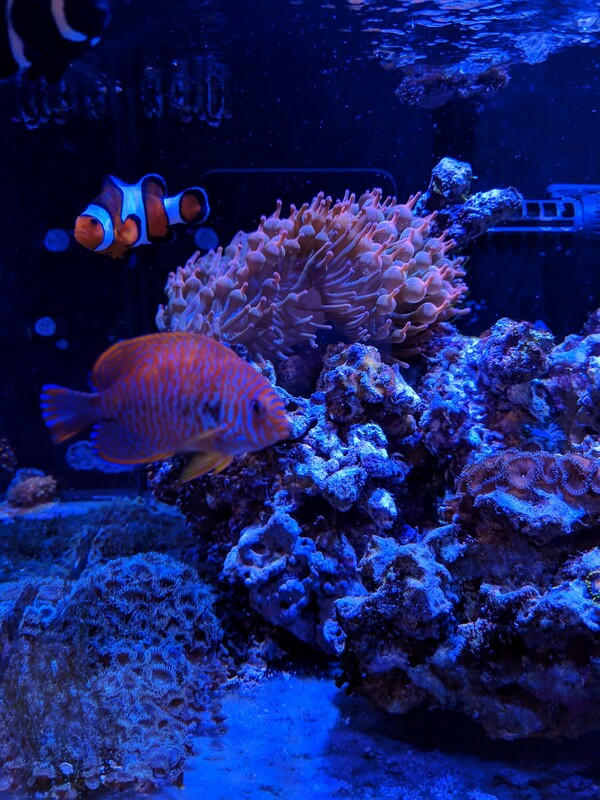 How does it do with the corals? Great looking tank and I'm looking forward to following. I just set up my IM25 this week. There are two things in my live that I will never understand, my RBTA and my wife.